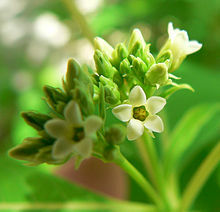 Apocynaceae is a faimily o flouerin plants that includes trees, shrubs, yerbs, stem succulents, an vines, commonly cried the dogbane faimily, efter the American plant kent as dogbane, Apocynum cannabinum. ↑ Endress ME, Bruyns PV (2000). "A revised classification of the Apocynaceae s.l.". The Botanical Review. 66 (1): 1–56. doi:10.1007/BF02857781. ↑ Heiser CB (2003). Weeds in my garden: observations on some misunderstood plants. Portland, Oregon: Timber Press. p. 50. ISBN 0-88192-562-4. This page wis last eeditit on 8 November 2014, at 04:40.